I'm glad to see you are back from your jet-setting adventures. I have missed reading your blog in the last few weeks! What's the nicest thing about being home again? 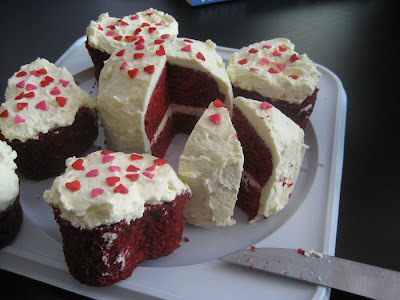 Your Valentine's Day baking project looks adorable! I'm not big on cake myself, but I do enjoy your baking stories. In an uncharacteristic move, I am making a Mexican Chocolate Cake tonight for a Valentine's Day dinner (yes, I'm a day late, but that's okay). I'm pretty excited about it because there's a warm, spicy, drizzly chocolate sauce to go along with the cake. Excellent. Oh, one more thing. I know you are a huge Nigella fan, so I thought I would tell you I received Nigella Express as a birthday gift after lusting after it in the bookstore. I've made a modified (vegetarian) version of her Mexican Chicken Salad, and it was amazing. I also made the Avocado Bruschetta using French bread (instead of sourdough), and it was fantastic. I think I am falling in love with Nigella! 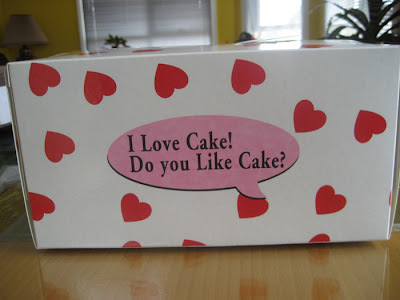 I like cake! And you! And your cupcakes! Sooo pretty! p.s. 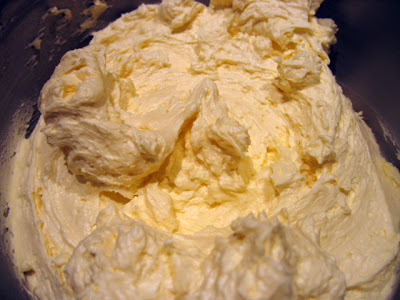 hmmm...what about cream cheese frosting next time, Miss? 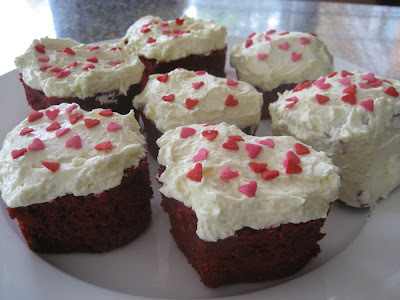 The frosting alone looks luscious, and I love the idea of little individual cakes. That must have taken quite a while to layer each one! Just adorable though. 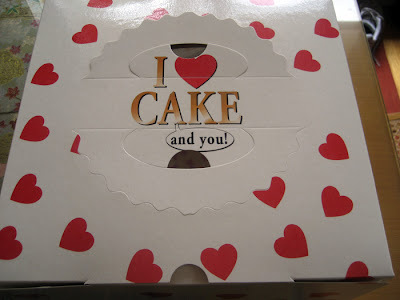 I need that cake box! 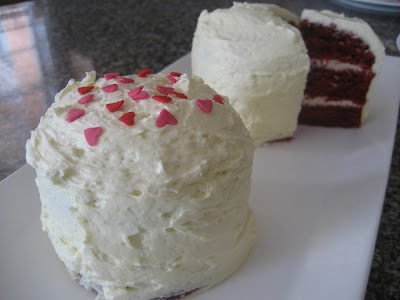 Love red velvet cake, even though my singular homemade effort also didn't turn out as planned (it was more like mauve velvet cake with droopy icing). The one from Magnolia Bakery was, however, the best thing I ate in New York. 60 bucks? wowzer, your link shows 17.99 US. Thats a huge price difference. I totally want that pan now and a muffin top pan. Interesting to read that you liked the cupcakes from The Little Cupcake! I was going to blog about them but 3 of the 4 I bought were horribly stale. I'm sure yours were delicious. I know this is random, but whenever I am in Melbourne, I find time to go to Leo's in Heidelberg and purchase all the sliced roast beef from the deli counter. It's medium rare, with a tinge of red in the very centre. It's my most favourite thing!!! I wish I could find something as good her in Adelaide. Oh, and love your blog very very much!